Miss Kitty is exactly what it sounds like, a cat themed game which does give you the impression that it was somewhat inspired by the Hello Kitty craze, though it looks quite different. It’s a pink cat, with big eyes and with a diamond pendant on her collar. This game was created by the developers from Aristocrat. You’re not going to be too impressed with the design of Miss Kitty, but perhaps its features will make it fun enough for you to play it. 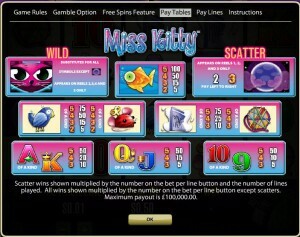 Miss Kitty has more paylines than the average Aristocrat slot, 50 of them being used on 5 reels. 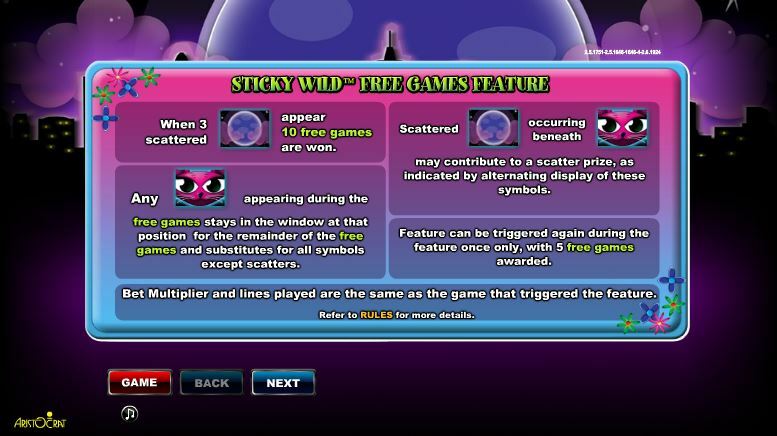 Free games with sticky wilds, scatters and regular wilds make up the list of features in this case. The biggest payouts mentioned by the paytable will give you $200, which is a big disappointment. The base game features are the ones you’re used to, so you get wilds and scatters while playing there. However, get access to the free spins and you will find that sticky wilds are present in this feature, making it a lot more fun to play. The Pink Miss Kitty symbol is the game’s wild, but one downside that it has compared with other slots is the fact that you only get it on four reels out of five (2nd, 3rd, 4th and 5th). Get it on any of those four reels, and it will try to be part of new combinations that are forming, acting as a substitute for another symbol, but only if the rest of the symbols for the combo are in place already. Since it can’t form its own combo (not appearing on enough reels for that) the wild will not give away prizes. The Full Moon is another good symbol to have, a scatter which appears on the first three reels (1 to 3). You will get a small prize, 3x the bet, when you have two scatters, while three will start the free spins. You will be rewarded with an interesting feature when you manage to land all three scattered Full Moon symbols in the same round. You will get 10 free spins at this point, with the Miss Kitty wilds becoming sticky for the duration. 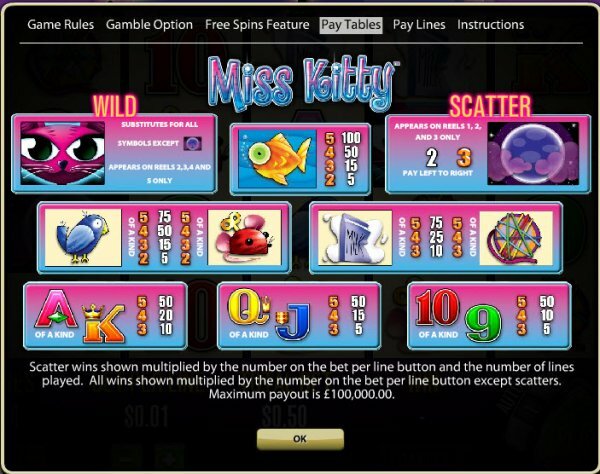 What this means is that whenever a Miss Kitty symbol appears on one of the reels, it will stay in that position until the free spins is over, hopefully helping you get more winning combinations. By the end of the free spins you should have more than one of these wilds helping out. Retriggering free spins is another possibility, and you need the same 3 scatters to do it. You receive another 5 free spins if this happens. You can only retrigger them once. You get to choose both the number of active lines and the line bet. The first one allows you to pick 1 to 50 lines, while the second option goes up to $2. With both options set to the maximum value, you can wager $100 on one spin. The game’s top prizes are very low, 100x the line bet being the most that is offered on the paytable, which means only $200. Even with 50 lines, which means a lot of chances to get paid, that’s still a very low prize. The game is themed around the Miss Kitty character, but it has a certain dark feel to it as well, with the huge full moon being visible behind the reels and with the city’s buildings being visible in that area as well. The reels offer cat or mouse related symbols, plus things like balls of string for Miss Kitty to play with. It’s a cute design, and if you’re a fan of cats you will probably want to see it for yourself. Symbols: Cat (wild), Full Moon (scatter, 2x the bet), Goldfish (100x), Canary (75x), Toy Mouse (75x), Milk (75x), Ball of String (75x), Ace (50x), King (50x), Queen (50x), Jack (50x), Ten (50x) and Nine (50x). Cat lovers seem to be everywhere these days, so I’m sure the game will have a lot of fans. It has some advantages of its own, but the top prize is definitely not among them. 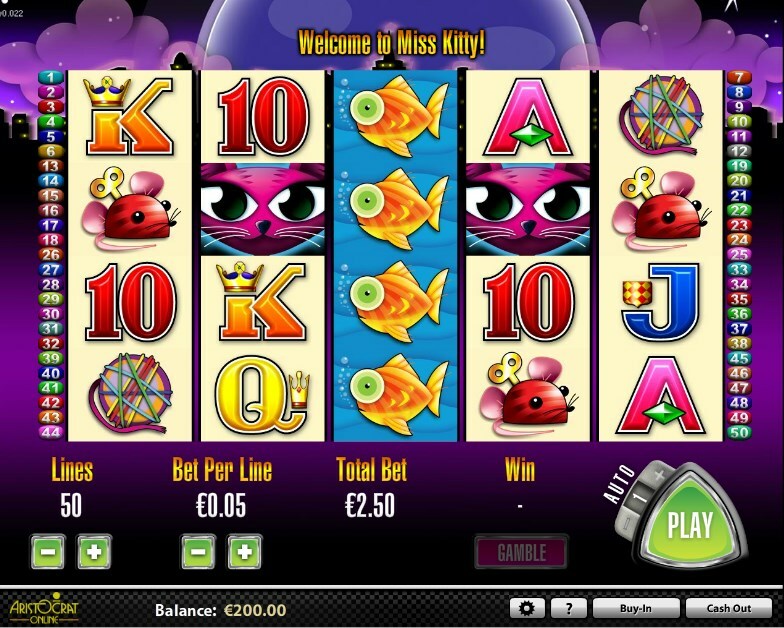 The Miss Kitty slot machine is offered through the Aristocrat platform, so if you want to play it for real or just to practice, look out for casinos that use it.